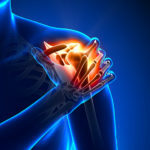 The tendons that are most commonly injured or develop wear-and-tear are the four rotator cuff tendons and one of the biceps tendons. Tendons are strong fibers that form a cord and connect muscles to bones. When the tendons become inflamed or frayed they cause pain and can eventually tear. A sudden fall or shoulder dislocation can also result in a tear. Tearing of these cords off of their bony attachments results in pain and/or lack of motion at the shoulder. These tears can be partial or full thickness. Partial tears are often able to be treated with non-surgical treatments but full thickness tears may require surgical repair. If large rotator cuff tears are left untreated for too long, they can become unrepairable. Long-standing, full thickness tendon tears can result in a less stable joint or migration of the head of the humerus (arm bone) out of normal alignment with the socket, eventually resulting in a type of arthritis called rotator cuff arthropathy. If rotator cuff arthropathy develops, it can be treated conservatively with injections and oral anti-inflammatory medications (if not contraindicated). If symptoms worsen or result in progressive pain, some patients may be a candidate for a reverse total shoulder replacement.